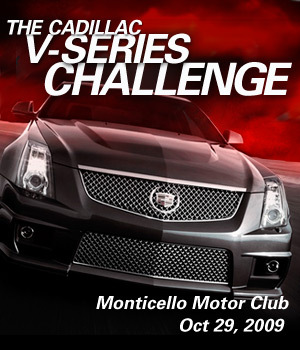 Tomorrow is the Bob Lutz Cadillac V-Series Challenge. For those of you who don’t know, Bob Lutz, an auto industry icon and currently a Vice Chairman at GM, first invited writers and then any and all owners of cars comparable to the Cadillac CTS-V to apply to get all Speed Racer with him on October 29 at the Monticello Motor Club in Monticello, N.Y.
Of the 120 people who gave a crap, Lutz chose seven. Of the seven, three are auto journalists: Jalopnik’s Wes Silver and his Jaguar XFR; The Truth About Cars’ Jack Baruth; and Lawrence Ulrich of the fancy NY Times. The journalist invites are clearly a tactical move on Lutz’ part. The other four are joe-blows. Michael from New Jersey and Michael from New York are bringing a BMW M5 and M3 respectively. (Perhaps Lutz was feeling nostalgic for his days as a BMW exec.) Tom of Philly will race his Audi RS4 and Chris from Michigan will bring his Cadillac CTS-V.
It’s clear who Lutz thinks Speed Racer is, but then who is Racer X? And what about Trixie? And that weird monkey? Let’s leave those questions in the obtuse pile, and focus on the race itself. There are many variables at play and while it’s easy to start comparing the cars themselves, the track and driver experience are huge variables. With Monticello, you’ve got one big straight and then a bunch of tight bends. I’m thinking the Caddy’s power to weight ratio and gearing could increase its odds, especially because it will take a super savvy driver to pull out the M5′s potential. And let’s talk about drivers. While Lutz doesn’t have much open track experience, the dude is fearless and all heart. Selected to compete against the CTS-V was an E60 BMW M5, a Jaguar XF Supercharged, an E90 BMW M3, a B7 Audi RS4 and a Mitsubishi Evo X MR. A Jaguar XF-R was originally selected, but pulled out due to potential overheating problems with the brakes. The event took place under grey skies at the Monticello Motor Club in Monticello, N.Y. and we now have the results. Taking top honors was former GM Performance Division Executive John Heinricy with a lap time of 2m and 46.56s in the Cadillac CTS-V.
Diesel Subarus On Their Way? Sorry to burst your bubble, Adrienne. Become of fan of Cadillac on facebook and you can tune into the live news feed as the action unfolds at Monticello Motor Club.